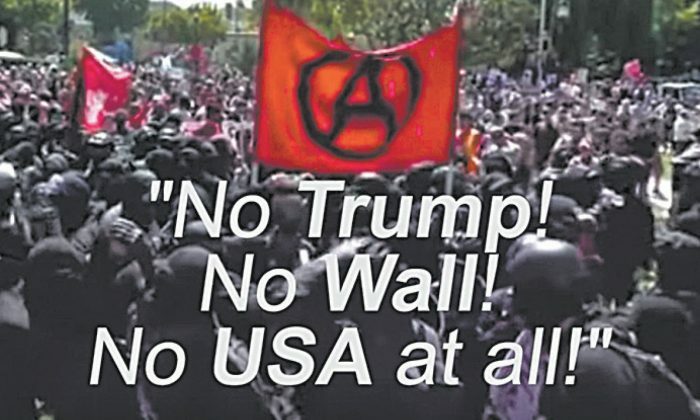 A new documentary exposes the far-left extremist group Antifa and its ties to communist revolutionary groups in the United States. It shows that the group of masked, black-clad protesters known for using violence and intimidation to silence conservatives may have an agenda pushed from behind the scenes. Antifa promotes a blend of anarchy and communism, and was formed in 1920s Germany as the violence and intimidation wing of the Communist Party of Germany (KPD). In a previous report, The Epoch Times exposed its origins, noting that Antifa, then known as Antifaschistische Aktion (“Antifascist Action”), was created under the direct guidance of the Russian Soviet regime—a brutal dictatorship that, according to “The Black Book of Communism,” would eventually kill more than 20 million people. Loudon said he and his fellow researchers sought to find out whether Antifa still maintained Communist Party links. They not only found this to be true, but also found that mainstream political ties have given a free pass to Antifa’s violence. In the group’s recent violent clashes in Berkeley, Charlottesville, and Oakland, the local police present at the incidents were allegedly told to stand down. In Charlottesville, the police even led right-wing protesters through the mob of Antifa protesters where violence then took place. “We found that Antifa violence was most prevalent in cities controlled by Democratic city councils, in which the police were under the control of the councils,” Loudon said. He said that in Berkeley, Antifa is affiliated with the far-left extremist group By Any Means Necessary (BAMN), and several senior Berkeley political figures—including Berkeley Mayor Jesse Arreguin—are members of the BAMN Facebook group. BAMN, Loudon notes, was an outgrowth of the Trotskyist Revolutionary Workers League. Antifa’s ties to communist and extremist groups vary depending on where it operates. Loudon said in Orlando, Antifa is very close to the Democratic Socialists of America. The Texas branch of Antifa is tied to the local Red Guard, a Maoist organization. Another Antifa branch, Refuse Fascism, is a front for the Revolutionary Communist Party. One of the main endorsers of Refuse Fascism, Loudon reports, is Bill Ayers, a former leader of the Weather Underground, a communist organization that carried out terrorist attacks in the United States in the 1970s. The organization had infamously planned to kill 25 million Americans if the communist revolution succeeded. “Antifa today is like a franchise,” Loudon said, adding that “in many instances” it also has close ties to the Democratic Party. Both Antifa and the Nazi brownshirts, he added, are little more than “street gangs” promoting totalitarian systems. Loudon noted that even historically, when the Nazis won in Germany, many former members of the communist KPD, which started Antifa, became members of Hitler’s brownshirts.